Will school shooting spur gun control action? At least three guns were found  a Glock and a Sig Sauer, both pistols, inside the school, and a .223-caliber rifle in the back of a car, authorities said. A law enforcement official speaking on condition of anonymity said some of the guns used in the attack may have belonged to Lanza's family. His mother had legally registered four weapons, his father two. Authorities also recovered three other guns  a Henry repeating rifle, an Enfield rifle and a shotgun. It was not clear exactly where those weapons were found. 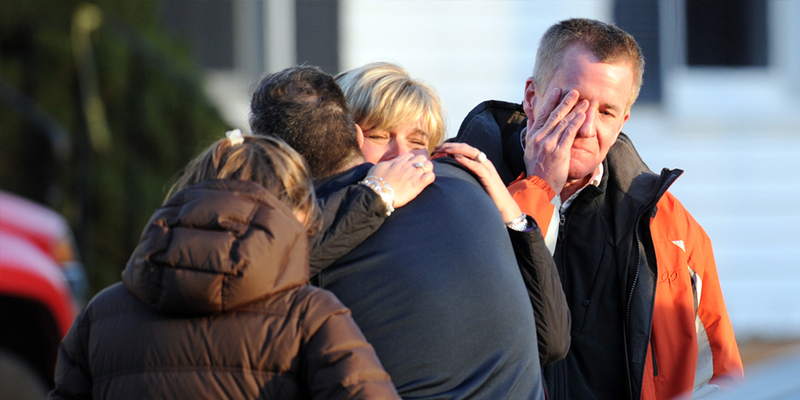 A photo posted by The Newtown Bee newspaper showed a group of young students  some crying, others looking visibly frightened  being escorted by adults through a parking lot in a line, hands on each other's shoulders. An 8-year-old student told CBS New York station WCBS-TV he was on his way to the school's office when he saw the gunman. "I saw some of the bullets going down the hall and then a teacher pulled me into her classroom," the boy said. Stephen Delgiudice said his 8-year-old daughter heard two big bangs and teachers told her to get in a corner. His daughter was fine. Delgiudice's daughter told him that she heard the loudspeaker come on and swearing being broadcast over it, Delgiudice told CBS News. That prompted the teacher to lock the classroom door. "That's basically what saved their lives, I think," Delgiudice told CBS News. "He said, `Guys! Get down! Hide!"' Varga said. "So he was actually a hero." The teacher said he did not know if the custodian survived. Mary Pendergast, who lives close to the school, said her 9-year-old nephew was in the school at the time of the shooting, but wasn't hurt after his music teacher helped him take cover in a closet.